Embossers - Embossers - Ideal, Just-rite, Executive - Corporate, Logo, Scientific, Notary, Professional, Monogram, Wedding and more! We are the Direct Source for Embossers & replacement inserts - Ideal, Just-rite, etc ~ for your: Wedding . Monogram . Company Logo * . Notary . Family Crest *. Library . Address . Justice of the Peace . Kitchen Embossers & more! 1) The Standard Model Embosser works well on standard stationery weight paper, with a maximum 'reach' from edge of page to center of embossed image is 1.5". 2) The Long Reach Desk Embosser works well on heavier than standard stationery weight paper, with a maximum 'reach' of 2.5". 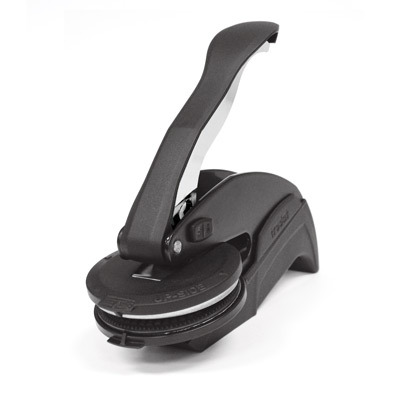 3) The Extra Long Reach Desk Embosser works well on heavier than standard weight paper, with a maximum 'reach' of 4".